Westfield in Bloom: Barry - one of the hardest working volunteers!!! Barry Corcoran wins the big prize...that is being one of the most dedicated volunteers in helping Downtown Westfield Corporation & Williams Nursery in this year's America in Bloom (locally known as Westfield in Bloom) competition. For over two weeks, Barry has been assisting not only in supervising juveniles who have been assigned community service, but he has been working very hard himself. 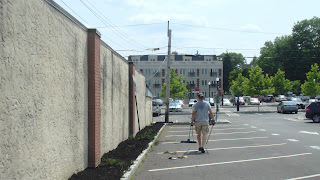 He not only supervised, but also weeded and spread mulch in Parking Lot #1 between Elm and Prospect Streets. Thank you Barry! and thank you DPW for delivering the mulch!